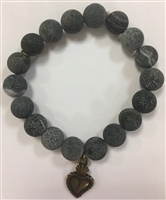 Gray multi-tone beaded stretch bracelet with gold-tone sacred heart charm. Comes with white organza drawstring gift bag. Makes a great gift! 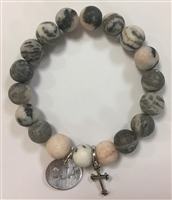 Gray and pink multi-tone beaded stretch bracelet with silver CJA-stamped circle and cross charms. Comes with white organza drawstring gift bag. Makes a great gift! Silver metal cuff bracelet hand-stamped with the latitude and longitude coordinates of Cor Jesu Academy! Locally made by Addi Lu's on Telegraph. 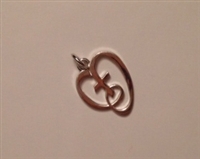 Will look great stacked with your other bracelets. Comes with white organza drawstring gift bag. Makes a great gift! Buy all three Cor Jesu bracelets and save! Wear them together or separately. 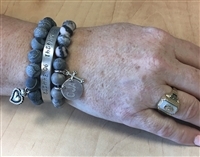 Includes one each of the beaded gray Sacred Heart bracelet, the gray and pink beaded bracelet with CJA and cross charms, and the silver latitude longitude cuff bracelet. Each comes in a white organza gift bag perfect for gift giving. Supplies are limited so get yours today!